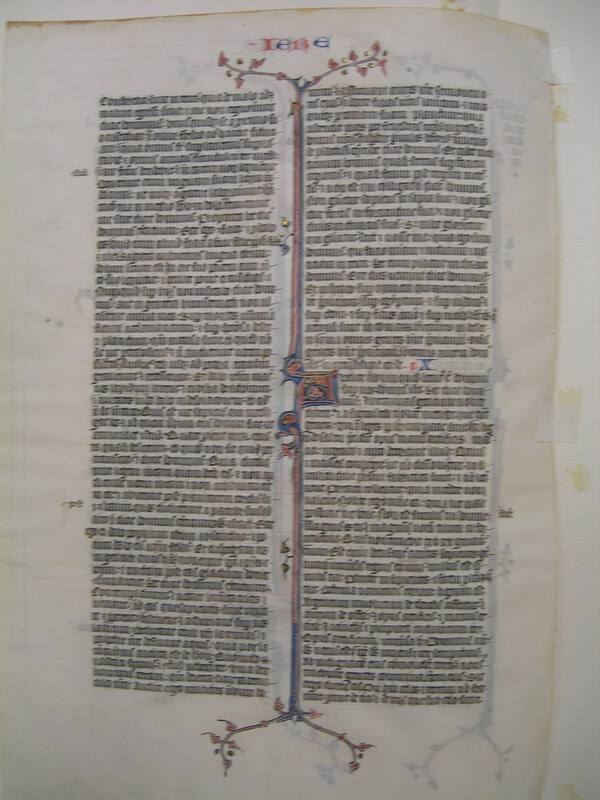 Text: Jeremiah 7:27-9:3 (recto) and 9:4-10:11 (verso). 27 And thou shalt speak to them all these words, but they will not hearken to thee: and thou shalt call them, but they will not answer thee. 28 And thou shalt say to them: This is a nation which hath not hearkened to the voice of the Lord their God, nor received instruction: Faith is lost, and is carried away out of their mouth. 29 Cut off thy hair, and cast it away: and take up a lamentation on high: for the Lord hath rejected and forsaken the generation of his wrath, 30 Because the children of Juda have done evil in my eyes, saith the Lord. They have set their abominations in the house in which my name is called upon, to pollute it; 31 And they have built the high places of Topeth, which is in the valley of the son of Ennom, to burn their sons, and their daughters in the fire: which I commanded not, nor thought on in my heart. 32 Therefore behold the days shall come, saith the Lord, and it shall no more be called Topeth, nor the valley of the son of Ennom: but the valley of slaughter, and they shall bury in Topeth, because there is no place. 33 And the carcasses of this people shall be meat for the fowls of the air, and for the beasts of the earth, and there shall be none to drive them away. 34 And I will cause to cease out of the cities of Juda, and out of the streets of Jerusalem, the voice of joy, and the voice of gladness, the voice of the bridegroom and the voice of the bride: for the land shall be desolate. 1 At that time, saith the Lord, they shall cast out the bones of the kings of Juda, and the bones of the princes thereof, and the bones of the priests, and the bones of the inhabitants of Jerusalem, out of their graves. 2 And they shall spread them abroad to the sun, and the moon, and all the host of heaven, whom they have loved, and whom they have served, and after whom they have walked, and whom they have sought, and adored: they shall not be gathered, and they shall not be buried: they shall be as dung upon the face of the earth. 3 And death shall be chosen rather than life by all that shall remain of this wicked kindred in all places, which are left, to which I have cast them out, saith the Lord of hosts. 4 And thou shalt say to them: Thus saith the Lord: Shall not he that falleth, rise again? and he that is turned away, shall he not turn again? 5 Why then is this people in Jerusalem turned away with a stubborn revolting? they have laid hold on lying, and have refused to return. 6 I attended, and hearkened; no man speaketh what is good, there is none that doth penance for his sin, saying: What have I done? They are all turned to their own course, as a horse rushing to the battle. 7 The kite in the air hath known her time: the turtle, and the swallow, and the stork have observed the time of their coming: but my people have not known the judgment of the Lord. 8 How do you say: We are wise, and the law of the Lord is with us? Indeed the lying pen of the scribes hath wrought falsehood. 9 The wise men are confounded, they are dismayed, and taken: for they have cast away the word of the Lord, and there is no wisdom in them. 10 Therefore I will give their women to strangers, their fields to others for an inheritance: because from the least even to the greatest all follow covetousness: from the prophet even to the priest, all deal deceitfully. 11 And they healed the breach of the daughter of my people disgracefully, saying Peace, peace: when there was no peace. 12 They are confounded, because they have committed abomination: yea rather they are not confounded with confusion, and they have not know how to blush: therefore shall they fall among them that fall; in the time of their visitation they shall fall, saith the Lord. 13 Gathering I will gather them together, saith the Lord, there is no grape on the vines, and there are no figs on the fig tree, the leaf is fallen: and I have given them the things that are passed away. 14 Why do we sit still? assemble yourselves, and let us enter into the fenced city, and let us be silent there: for the Lord our God hath put us to silence, and hath given us water of gall to drink: for we have sinned against the Lord. 15 We looked for peace and no good came: for a time of healing, and behold fear. 16 The snorting of his horse was heard from Dan, all the land was moved at the sound of the neighing of his warriors: and they came and devoured the land, and all that was in it: the city and its inhabitants. 17 For behold I will send among you serpents, basilisks, against which there is no charm: and they shall bite you, saith the Lord. 18 My sorrow is above sorrow, my heart mourneth within me. 19 Behold the voice of the daughter my people from a far country: Is not the Lord in Sion, or is not her king in her? why then have they provoked me to wrath with their idols, and strange vanities? 20 The harvest is passed, the summer is ended, and we are not saved. 21 For the affliction of the daughter of my people I am afflicted, and made sorrowful, astonishment hath taken hold on me. 22 Is there no balm in Galaad? or is no physician there? Why then is not the wound of the daughter of my people closed? -mini, et assúmant aures vestræ sermónem oris ejus, et docéte fílias vestras laméntum, et unaquaeque próximam suam planctum: quia ascéndit mors per fenéstras nostras; ingréssa est domos nostras, dispérdere párvulos defóris, júvenes de platéis. Lóquere: Hæc dicit Dóminus: Et cadet morticínum hóminis quasi stercus super fáciem regiónis, et quasi fœnum post tergum meténtis, et non est qui cólligat. Hæc dicit Dóminus: Non gloriétur sápiens in sapiéntia sua, et non gloriétur fortis in fortitúdine sua, et non gloriétur dives in divítiis suis: sed in hoc gloriétur, qui gloriátur, scire et nosse me, quia ego sum Dóminus qui fácio misericórdiam, et judícium, et justítiam in terra: hæc enim placent mihi, ait Dóminus. Ecce dies véniunt, dicit Dóminus, et visitábo super omnem qui circumcísum habet præpútium, super Ægýptum, et super Juda, et super Edom, et super fílios Ammon, et super Moab; et super omnes qui attónsi sunt in comam, habitántes in desérto: quia omnes gentes habent præpútium, omnis autem domus Israël incircumcísi sunt corde. X. Audíte verbum quod locútus est Dóminus super vos, domus Israël. Hæc dicit Dóminus: Juxta vias géntium nolíte díscere, et a signis cæli nolíte metúere, quæ timent gentes, quia leges populórum vanæ sunt. Quia lignum de saltu praecidit opus manus artíficis in áscia: argénto et auro decorávit illud: clavis et málleis cómpegit, ut non dissolvátur: in similitúdinem palmæ fabricáta sunt, et non loquéntur: portáta tolléntur, quia incédere non valent. Nolíte ergo timére ea, quia nec male possunt fácere, nec bene. Non est símilis tui, Dómine: magnus es tu, et magnum nomen tuum in fortitúdine. Quis non timébit te, o Rex géntium? tuum est enim decus: inter cunctos sapiéntes géntium, et in univérsis regnis eórum, nullus est símilis tui. Páriter insipiéntes et fátui probabúntur: doctrína vanitátis eórum lignum est. Argéntum involútum de Tharsis affértur, et aurum de Ophaz: opus artíficis et manus ærárii. 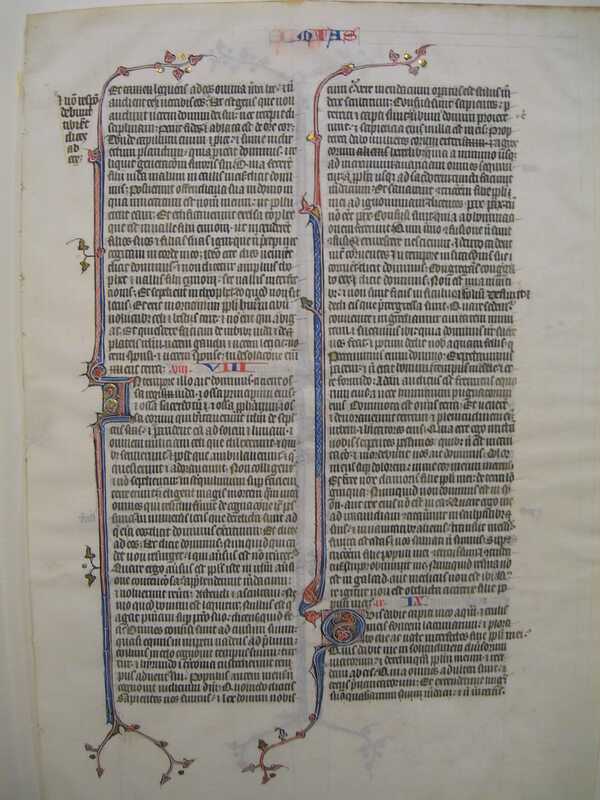 Hyacínthus et púrpura induméntum eórum: opus artíficum univérsa hæc. Dóminus autem Deus verus est, ipse Deus vivens, et rex sempitérnus. Ab indignatióne ejus commovébitur terra, et non sustinébunt gentes comminatiónem ejus. Sic ergo dicétis eis: Dii qui cælos et terram non fecérunt, péreant de terra et de his quæ sub cælo sunt! ...they have strengthened themselves upon the earth, for they have proceeded from evil to evil, and me they have not known, saith the Lord. 4 Let every man take heed of his neighbor, and let his not trust in any brother of his: for every brother will utterly supplant, and every friend will walk deceitfully. 5 And a man shall mock his brother, and they will not speak the truth: for they have taught their tongue to speak lies: they have laboured to commit iniquity. 6 Thy habitation is in the midst of deceit: Through deceit they have refused to know me, saith the Lord. 7 Therefore thus saith the Lord of hosts: Behold I will melt, and try them: for what else shall I do before the daughter of my people? 8 Their tongue is a piercing arrow, it hath spoken deceit: with his mouth one speaketh peace with his friend, and secretly he lieth in wait for him. 9 Shall I not visit them for these things, saith the Lord? or shall not my soul be revenged on such a nation? 10 For the mountains I will take up weeping and lamentation, and for the beautiful places of the desert, mourning: because they are burnt up, for that there is not a man that passeth through them: and they have not heard the voice of the owner: from the fowl of the air to the beasts they are gone away and departed. 11 And I will make Jerusalem to be heaps of sand, and dens of dragons: and I will make the cities of Juda desolate, for want of an inhabitant. 12 Who is the wise man, that may understand this, and to whom the word of the mouth of the Lord may come that he may declare this, why the land hath perished, and is burnt up like a wilderness, which none passeth through? 13 And the Lord said: Because they have forsaken my law, which I gave them, and have not heard my voice, and have not walked in it. 14 But they have gone after the perverseness of their own heart, and after Baalim, which their fathers taught them. 15 Therefore thus saith the Lord of hosts the God of Israel: Behold I will feed this people with wormwood, and give them water of gall to drink. 16 And I will scatter them among the nations, which they and their fathers have not known: and I will send the sword after them till they be consumed. 17 Thus saith the Lord of hosts the God of Israel: Consider ye, and call for the mourning women, and let them come: and send to them that are wise women, and let them make haste: 18 Let them hasten and take up a lamentation for us: let our eyes shed tears, and our eyelids run down with waters. 19 For a voice of wailing is heard out of Sion: How are we wasted and greatly confounded? because we have left the land, because our dwellings are cast down. 20 Hear therefore, ye women, the word of the Lord: and let your ears receive the word of his mouth: and teach your daughters wailing: and every one her neighbor mourning. 21 For death is come up through our windows, it is entered into our houses to destroy the children from without, the young men from the streets. 22 Speak: Thus saith the Lord: Even the carcass of man shall fall as dung upon the face of the country, and as grass behind the back of the mower, and there is none to gather it. 23 Thus saith the Lord: Let not the wise man glory in his wisdom, and let not the strong man glory in his strength, and let not the rich man glory in his riches: 24 But let him that glorieth glory in this, that he understandeth and knoweth me, for I am the Lord that exercise mercy, and judgment, and justice in the earth: for these things please me, saith the Lord. 25 Behold, the days come, saith the Lord, and I will visit upon every one that hath the foreskin circumcised. 26 Upon Egypt, and upon Juda, and upon Edom, and upon the children of Ammon, and upon Moab, and upon all that have their hair polled round, that dwell in the desert: for all the nations are uncircumcised in the flesh, but all the house of Israel are uncircumcised in the heart. 1 Hear ye the word which the Lord hath spoken concerning you, O house of Israel. 2 Thus saith the Lord: Learn not according to the ways of the Gentiles: and be not afraid of the signs of heaven, which the heathens fear: 3 For the laws of the people are vain: for the works of the hand of the workman hath cut a tree out of the forest with an axe. 4 He hath decked it with silver and gold: he hath put it together with nails and hammers, that it may not fall asunder. 5 They are framed after the likeness of a palm tree, and shall not speak: they must be carried to be removed, because they cannot go. Therefore, fear them not, for they can neither do evil nor good. 6 There is none like to thee, O Lord: thou art great and great is thy name in might. 7 Who shall fear thee, O king of nations? for thine is the glory: among all the wise men of the nations, and in all their kingdoms there is none like unto thee. 8 They shall all proved together to be senseless and foolish: the doctrine of their vanity is wood. 9 Silver spread into plates is brought from Tharsis, and gold from Ophaz: the work of the artificer, and of the hand of the coppersmith: violet and purple is their clothing: all these things are the work of artificers. 10 But the Lord is the true God: he is the living God, and the everlasting king, at his wrath the earth shall tremble, and the nations shall not be able to abide his threatening. 11 Thus then shall you say to them: The gods that have not made heaven and earth, let them perish from the earth, and from among those places that are under heaven.